A new kind of drug for the deadliest form of skin cancer helped some patients survive for at least three years, a study shows. It's a remarkable advance for patients who until recently faced dismal chances of living for more than a few months. About 40 percent of melanoma patients in the study were still alive three years later. The drug, which targets the immune system, was used to treat former President Jimmy Carter, who was diagnosed last summer with melanoma that had spread to his brain. "This is incredible," Dr. Caroline Robert, the study's lead author, said of the results released Wednesday. "I spend my time telling my residents that these patients would be dead if it was five years ago." The drug, Keytruda, is among a new class of genetically engineered antibody-based medicines. They block proteins that prevent the body's disease-fighting immune system from attacking cancer cells. This immunotherapy approach is transforming treatment for several kinds of cancer with drugs that are often less toxic than chemotherapy. The latest findings for Merck's Keytruda (kee-TROO'-duh) are among the best long-term data ever for treating melanoma that has spread to other organs, Robert and other cancer experts said. 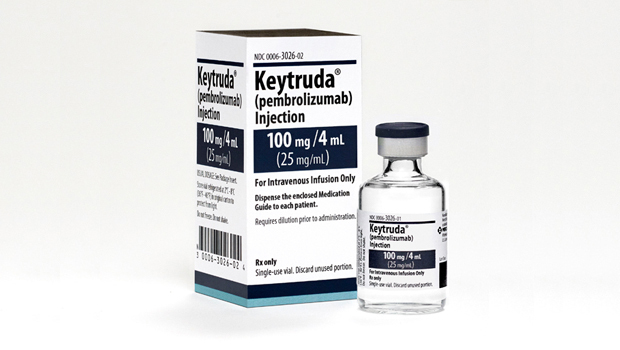 Keytruda, also known as pembrolizumab (pem-bro-LIZ'-uh-mab,) is one of the treatments Carter received after his diagnosis last year, and he has done well. "The way we think about this is that the drug has kept the disease under control and it has been well-tolerated," Cleveland Clinic cancer specialist Dr. Dale Shepard told CBS News in December. "For someone who is 90 years old, getting these sorts of therapies and doing so well, it's pretty amazing." In March, the former president announced that he no longer needs treatment for cancer, though his spokeswoman said he would "resume treatment if necessary." Carter, now 91, was seen beaming last weekend as he helped give an honorary humanities degree to rocker Gregg Allman at Georgia's Mercer University, where Carter is a trustee. The new results in 655 patients are a follow-up to research that led to the 2014 approval of Keytruda for advanced melanoma. In addition to the 40 percent survival rate at three years, Robert said 85 patients remain cancer-free. "Of course it's not enough," but it raises hope for an eventual cure for the disease, she said. Robert, a melanoma researcher at Gustave Roussy cancer center near Paris, has worked as a consultant for Merck and Bristol-Myers Squibb, which makes two other immunotherapy drugs approved for advanced melanoma. The newest drug, Opdivo, targets the same protein as Keytruda, while Yervoy targets a different protein. Dr. Len Lichtenfeld, the American Cancer Society's deputy chief medical officer, said the new Keytruda research "is a big deal." "Looking to the future, these treatments are going to be used earlier in the course of this disease," sometimes combined with other immunotherapy drugs, Lichtenfeld said. The Keytruda study was released at a news briefing organized by the American Society of Clinical Oncology in advance of the group's annual meeting next month in Chicago. The American Cancer Society estimates that almost 77,000 people will be diagnosed with melanoma this year and that 10,000 will die from the disease. It's much less common than other skin cancers and much more aggressive and likely to spread to other organs. The earliest sign is often a large misshapen or unusually colored mole that grows in size. Yervoy, approved in 2011, has the longest-term data of the three drugs, with an eight-year survival rate of about 20 percent, said Dr. Thomas Gajewski, a University of Chicago immunotherapy expert. He said success with Keytruda echoes what he's seen in melanoma patients at his center. They receive IV infusions of the drug for an hour every few weeks for an indefinite time unless they develop severe side effects, which he said are rare. Rashes and internal inflammation are the most common side effects and they are reversible if the drug is stopped. The yearly cost is more than $100,000, a higher price than some conventional cancer drugs. Some insurers pay for the treatment, which Gajewski called "a game-changer" for melanoma, allowing many patients to return to work and live productive lives. In other immunotherapy developments, a new drug was approved Wednesday for bladder cancer, and Opdivo was approved Tuesday for another cancer, Hodgkin lymphoma.